Cataclyst - "Monuments of a Rubicund Age"
"Monuments of a Rubicund Age"
A strange project that for a moment united Peter Andersson (raison d'etre) and Johanna Rosenqvist (ex-Institut, Koeff) in the distant 1992. 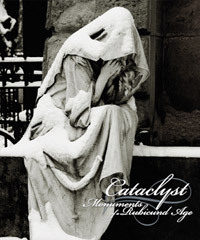 Cataclyst's music combines the melancholic beauty of early raison d'etre and Necrophorus, harsh industrial rhythms of Institut and tribal-elements of another undeservingly forgotten project of Peter - Svasti-Ayanam... What differs this product from other works of Swedish industrial scene masters is the atmosphere of remote fairy worlds in which you smoothly sink into while listening to "Monuments of a Rubicund Age". Peter and Johanna have woven an infinite labyrinth of mirages, walking through which will be a pleasant surprise for both the fans of ambient / experimental / industrial and more conservative gothic lovers. The first edition of the album was published by Peter's own label Yantra Atmospheres in 1999 and was limited to 100 copies. This reissue has been made by joint efforts of the labels Tantric Harmonies and Zhelezobeton, it contains a shorter version of the album's last piece + bonus-track. Original photographs are made by Pavel Bourchenko. Cataclyst is een oud bijna vergeten project van Peter Andersson (Raison D'etre). Een project waarop hij bovendien samenwerkt met Johanna Rosenqvist (Institut). Oorspronkelijk werd het album als CDR uitgebracht in 1992, met een oplage van 100 stuks. Nu hebben de labels Tantric Harmonies en Zhelezobeton een heruitgave van dit werkje bestelligd, in een oplage van 600 stuks. Een heruitgave, toch niet helemaal. Het laatste nummer van de oorspronkelijke release ("Dwarfs In Hidden Realm") staat op deze uitgave in een kortere versie. En een ander nummer van Peter Andersson dat bepaald niet breed verkrijgbaar was "As He Scourged The Earth (Wierd Mix)" is toegevoegd. De 43 minuten van dit werkje nemen je uiteindelijk mee door een erg mooi landschap vol melancholie. Een reis voor hen die van sfeerlandschappen houden. Niet echt ambient, niet echt industrial, niet echt tribal, niet echt ... noem het maar op in datzelfde straatje. Een album dat niet bizar donker is, dat echt nummers kent. Een album dat je vooral meesleept of je nu wil of niet. Erg mooi in elkaar gezet. Een reis waarin je de tijd even vergeet (om wakker te worden als de klok net geen drie kwartier verder is). Oftewel jongens wat is dit mooi. Iedere liefhebber van Raison D'etre moet dit schijfje gewoon direct aanschaffen. Institut liefhebbers zullen dit waarschijnlijk te zacht en positief vinden, maar kunnen zeker ook een luisterbeurt wagen. Maar mooier nog ook velen die wel in de donkere sferen luisteren, maar nog altijd naar echt liedjes, dit is de muziek om ambient toegankelijk te maken (iets waar Raison D'etre toch al erg goed in is). De sprookjeswereld waarin je meegenomen wordt zit vol gevaar, maar vooral vol betovering. Een land waar regelmatig "zang" te horen is, vaak zonder echt te verstaan te zijn, maar wel duidelijk aangevend dat je niet alleen bent, dat anderen om je heen je zien, anderen die het vaak goed met je voor lijken te hebben. En zo wordt je steeds verder meegesleept deze wereld in, wordt het langzaamaan dan toch wat dreigender ("The Serpents Fang"), zelfs wel echte industrial noise, maar zonder zijn toegankelijkheid te verliezen. Een klein wonder geschiedt aldus. Naarmate ik dit werkje vaker luister raak ik er alleen maar voller van. Des te onbegrijpelijker wordt het voor mij dat dit werkje bijna vergeten leek. Want wat een meesterwerk weer. Voor D&D avonden, voor die tijden dat je rust wil vinden zonder direct de stereo uit te zetten, voor hen die graag met koptelefoon op zitten, en eigenlijk voor iedereen die niet bang is voor muziek die niet direct opgebouwd is volgens standaardpatronen en die echt meer sfeerlandschap is (geluidscollage klinkt hiervoor echt te negatief). In 1999 Peter Andersson together with Johanna Rosenqvist of Institut released a CD-R as Cataclyst, with on it very imaginative ambient music that already had been recorded back in 1992. 15 years later the Tantric Harmonies label takes the effort to re-release this material, which in 2003 was completely remastered by Peter Andersson, this time with an extra track added. ‘As He Scourged the Earth (Wierd mix)’ is originally from a difficult to find compilation cd named Perception Multiplied, Multiplicity Unified. As said Monuments of a Rubicund Age is a very varied offering. It features pure ambient pieces such as ‘The Gawds Are Still at Karnak I en II’, but also tracks like ‘Rubicund Age’ or ‘Dwarfs in Hidden Realm (short mix)’ that have a ritual touch like with Svasti-Ayanam, you hear parts of powernoise in ‘The Verge of Mortal Ground’ and especially in ‘The Serpent’s Fang’ in which ritual singing adds an extra sinister dimension to the noise. Furthermore you have voices that come and go and all sorts of samples and dark ambient drones. With Monuments of a Rubicund Age both artists have created a timeless, overall melanhcolic sounding, soundscape, that after all these years has not yet lost anything of it’s image invoking qualities. Yet on this release you hear the first steps towards later material as well, such as the use of choirs in the music of early Raison d’Etre times or various kinds of metal scraping sounds that you hear so often in dark ambient industrial music. This cd is beautiful and definitely recommended if you like spherical ambient with slightly gothic undertones. Monuments of a Rubicund Age is an unusual collection of atmospheric industrial settings that Cataclyst duo Peter Andersson (raison d'etre) and Johanna Rosenqvist (ex-Institut, Koeff) produced all the way back in 1992 (first issued by Andersson's own label Yantra Atmospheres in 1999, the current edition is a joint reissue by Tantric Harmonies and Zhelezobeton). No one should be too surprised that certain aspects of the sound design give off an early ‘90s scent but for the most part, if one didn't know the music first appeared fifteen years ago, one might just as easily think that it was produced recently. Full credit to Andersson and Rosenqvist, then, for creating material that doesn't sound dated despite its date of origin (the more cynical might explain it by arguing that the industrial genre itself hasn't changed radically over that time period). Monuments of a Rubicund Age's nine pieces occupy a hallucinatory space that draws upon gothic, industrial, and ambient styles. A typical piece works simple tribal beat patterns, distorted voices, and chanting choirs into a haunted, sonic equivalent to the funereal imagery depicted in the black and white photography by Pavel Bourchenko that adorns the CD cover. The light-footed jaunt that grounds the ten-minute ‘Short Mix' of “Dwarfs in Hidden Realm” appears harmless enough, especially when accented by a meandering flute and bell accents, but the unintelligible garble of its backwards speaking voice gives the piece an unsettling edge, an effect intensified by the howl that erupts at its close. Mr. Andersson, present us another facet in his long carrear as musician. This time with CATACLYST’s album, which was released back in 1992 by his own label Tantric Harmonies, and now re-released by Zhelezobeton? This album floats into a dynamism only possible for a creative mind as the one of Mr Andersson, but this time with the collaboration of Johanna Rosenquist (Institute), the music has a palpable melancholic beauty atmosphere enriched by some elements of rhythmic industrial character which complements the development of each track as “Rubicund Age” with a ritualistic Atmosphere and dismal choruses. Or “The Sands Are still At Karnak I & II” with a high dark ambient environment patterns, with melancholic passages of total desolation and abandonment. some smells of industrial traces can be hear from time to time in some of the other tracks included here, and all of them having the perfect balance to keep your attention from the start to finish. The cd comes in a very beautiful presentation folder! !